Mail addon to simplify your inbox management. (Optional) Primary (E): Take - Takes attachments and deletes the mail after looting. C.O.D. Mail - Pays and takes C.O.D. attachments that you have enough gold for. C.O.D. Limit - Only mail with a C.O.D. amount less than this value will be paid. Set to zero (0) for no limit. Mostly translated to German, French and Japanese. Very special thanks to Scootworks, Llwydd and k0ta0uchi! A few of the warning messages still need translations, and some of the other translations are a bit rough. Any improvements to the translations would be welcome, if you want to send them on. If you like this addon, please click Favorite on the right, share with friends, and maybe leave a nice comment in the Comments tab above. I'm much more likely to continue development if I see the community appreciates it. When submitting bug reports, please do your best ahead of time to determine that the problem actually is with this addon. Disable other addons and make a list of steps to reproduce the issue. - Fix for crash to desktop when taking an email with both items and gold attached, such as Rewards for the Worthy mail. - Fix for "Our Thanks, Warrior" mail not getting collected under the PvP / Alliance War category. - Added support for including Battlegrounds rewards emails under the PvP category. - Fix LibTimeout bug when multiple addons use it. - Fix error that sometimes appears if you exit the inbox during a Take All operation and then open the inbox again. - Made the Delete part of Take All optional, so you can take the attachments and leave the message. - Fixed some issues with the first mail in the inbox being broken and Take All not running until you select the next mail. - Fixed Take All getting stuck at random when deleting a mail. - Fixed Take All getting stuck on mail with treasure map attachments that have a duplicate in your inventory. - Hireling emails will now be looted even if they would fill your reserved slots, if you have craft bag access and it is configured to loot directly to the craft bag. - You still need to have at least one free backpack slot, just like when you do a Take operation. - Fix for duplicate treasure map attachments being lost. - Better French translations. Thank you Llwydd! - Better Japanese translations. Thank you k0ta0uchi! - Better German translation formatting. Thank you Scootworks! - New setting "Take All Skips Empty System Mail"
- New setting "Take All Skips Empty Player Mail"
- Take All no longer stops on mail that doesn't match settings criteria. It skips and continues on. - Added Google translations for German, French, Japanese, and Russian. - Reword "skip other player mail" to "stop on other player mail" for clarity. - Localization support: Translators needed! - Oops, I have accidentaly overwitten MailR's "Save Message". Fixed. - another attempt to fix issues with Take All button, now it should make sure that mail is really empty before it is deleted. Last edited by Marazota : 02/26/19 at 04:40 AM. It sounds like you have a corrupted install with only a partial file extracted for Postmaster/localization/en.lua. That file should have 101 lines in it, not only 31. Please re-download and reinstall Postmaster. That was it. Thanks a ton for the quick response. It happens reliably and it doesn't miss a login or UI reload. I've verified that I have 3.8.1. I don't have too many addons and I can't imagine I have any that conflict. Re: Game crush after i try to take something from the mail?? Can verify this bug on all 3 alliances when attempting to open Rewards of the Worthy. 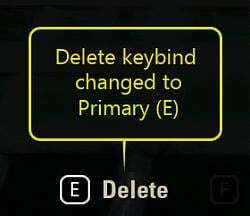 Disabling Postmaster removes the crash. Thanks everyone that has helped troubleshoot this issue. I've been able to reproduce the problem consistently, and should have a fix out shortly. Last edited by silvereyes : 10/22/18 at 09:28 PM. Really?, what makes this addone, make you not being able to play? You may not know it, but if you can't play the game due to an addon, you can DISABLE it? WHOOOAH yeah i know breaking news. If you have some thing to say, then at least contribute with more than that crap, like When i do xxxxx i then get xxxx, the comment you make makes no forking sense!! Disable the addon, empty your mailbox from old ID items, enable addon, job done!! Last edited by MartinL : 10/22/18 at 06:27 PM. Re: Re: Re: Game crush after i try to take something from the mail?? I've got this bug (freeze and exit to desktop) after trying to take Cyrodill rewards (those u get every 20k AP and those after campaign end with transmutation crystals). It happens only when using standard UI. It doesn't happen in gamepad UI (probally addon doesn't work when switched to gamepad UI). Output to chat is off. It happen when pChat addon is turned off. 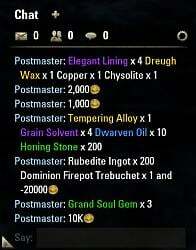 It happens when only Postmaster and Addon Selector is on - so it's rather not a problem with other addon. Thanks! That's very helpful information. 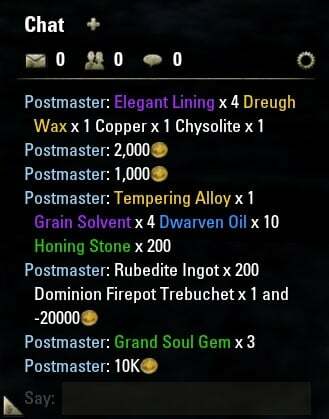 What alliance were the mails for, out of curiosity? I'm not doing anything fancy with those mails specifically, but I do perform some text matching on the sender name, which is Alliance-specific and could help explain why I don't see the problem. Last edited by Yahu : 10/22/18 at 05:28 PM. Re: Re: Game crush after i try to take something from the mail?? Re: Re: Re: Re: Re: Game crush after i try to take something from the mail?? There was no Error just "windowswaitsymbol" then desktop. Hrm, what was the mail, do you remember? I ran into that on a single character on EU with a specific Rewards for the Worthy email last patch, but I was never able to determine what was special about it. Other RftW mails worked just fine, and I've only seen the behavior on that one character. The workaround was to just temporarily disable Postmaster, take the RftW mail using the built in UI, and then reload Postmaster. Unfortunately, I don't have that mail anymore, and I haven't been able to reproduce the problem ever since. Edit: I do know that there at least used to be a bug in pChat related to handling malformed links or color styling. Do you use pChat? Do you have Postmaster outputting the attachment details to chat? I wonder if there's a problem with specific types of attachments having their links sent to chat that triggers the pChat bug. It was a reward with some money and a runebox attached, no pChat and no outputting in chat. I will try to install the new version tomorrow again and check it. Re: Re: Re: Re: Game crush after i try to take something from the mail?? Last edited by silvereyes : 10/22/18 at 10:27 AM.